The ability to enjoy all that Walt Disney World has to offer should not be limited only to those of us who have the gifts of sight, mobility, and hearing. In fact, I would take that one step further and say that the ability to enjoy the world itself should not be limited either. 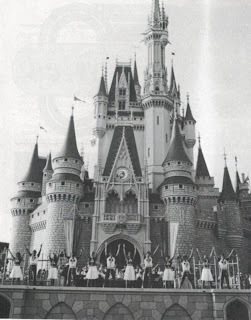 In 1976 the Kids of the Kingdom had thoughts along the same lines and premiered the “Lady America” show with something extra special, as explained in the Summer 1980 issue of the Disney News. No matter where you go in the Magic Kingdom, you’ll be entertained by any of a number of talented musical performers adding to the multitude of sights and sounds in each land. Whether it’s capturing the feeling of another place or time or telling a story through lyrics, dance and music, each group communicates a message in its own special way. The Kids of the Kingdom, a collection of energetic youths performing daily on the Cinderella Castle stage, add an extra dimension to their “Lady America” medley; the Kids’ choreography includes sign language for the deaf. 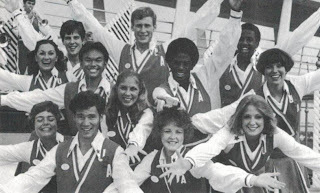 The show, created for the Walt Disney World bicentennial celebration in 1976 and has continued to be popular with Magic Kingdom guests ever since. “Lady America” follows a patriotic theme and the sign language was added to enhance the idea of neighborly American’s reaching out to each other. During the 20-minute show, the Kids perform songs such as “Lady America,” “Things Are Looking Up,” “I Like You,” “All Kinds of People,” “Thank God I’m a Country Boy” and “Everything is Beautiful” and “Still Be Some Love Left Over” to which they add signing. The signing fits easily into the choreography since the movements are fluid and are often symbolic of the words they express. Many of the signs can be quickly identified by even those not familiar with sign language. For example, the word “love” is expressed by pressing the hands over the heart. There would still be some love left over.